​It all began with an invitation to a college reunion, leading Brad Herzog to take stock: How has he measured up to his youthful aspirations? What constitutes a heroic life? So this modern-day Odysseus in Kerouac clothing embarks on a cross-country quest for insight. But instead of a voyage home to Ithaka following the Trojan War, this would-be hero is making his way toward his alma mater in Ithaca, New York. Starting with a view of Washington’s Mount Olympus, Herzog makes his way eastward, delving into his own psyche and the lives of everyday heroes along the way. He meets a teacher in a rural one-room schoolhouse in Troy (Oregon), a lifelong hobo in Iliad (Montana), a bomb-diffusing soldier from Sparta (Wisconsin) and an 87-year-old paragon of reliability in Pandora (Ohio). 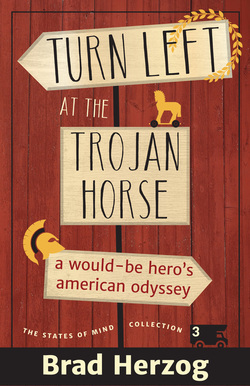 TURN LEFT AT THE TROJAN HORSE is a philosophical, historical and conversational trek across America and through the universal truths embedded in ancient myths. However, in the end it is simply the story of one man trying to find his way.